Hi, my name is Chris Hemhauser. I live in NJ I am a big fan of Jimmy Buffett and his life style. I am creating this page in hopes that I can convert others into Parrotheads like myself. I hope to bring the Buffett lifestyle to this page. I will be adding links to several other pages related to Jimmy. I also hope to add links to the Caribbean Islands as well. I was lucky enough to go on a cruise to three caribbean islands last year. I fell in love with them all. My personal favorite was Grand Cayman. I have been a Parrothead for about eight years now. I have only gone to three concerts. All in the last to years. I never new what I was missing. I had seen him once at PNC Bank Art Center in Homdel NJ and twice at the Sony Center in Camden NJ I thought the art center sucked for lawn seats and sound. I really loved the sony center. It had everything, good sound, view of the stage from the lawn seats, people, the waterfront, and the city of Philadelphia in the background. Jimmy Buffet Trivia How well do you know BUBBA? 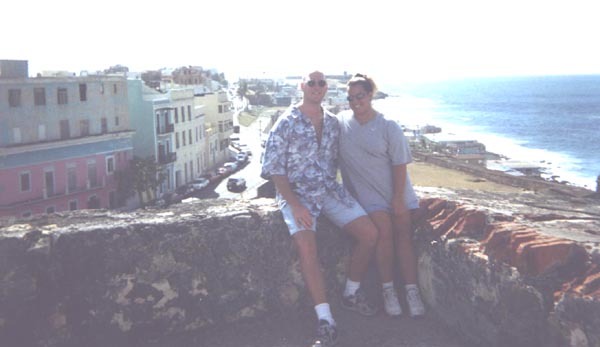 The above is a picture of my wife Colleen and I, taken in April 1999 in San Juan, Puerto Rico. Though I have yet to make the trip to Key West, FL. I hope to soon. During my H.S. years I started listening to JB. I would listen to his music and picture the tropics well before I even knew what he was about. Before I knew it college at arrived. Richard Stockton College of New Jersey and more Buffett music. I got more CD's and attended my first concert. There was a shock peole in all kinds of costumes and island gear. Pickups full of beach sand, full size grills and food, food, food. It was the nicest atmosphere I had ever seen at a concert. I was hooked. With my fourth concert coming up in Feb. 1999, I can't wait. I only wish I was a parrothead earlier in life. One of our favorite beaches to go to is Island Beach State Park NJ. We usual pack both dogs, toys and food, head out to the beach. here are two photos of or favorite spot. OUR LOCAL GET AWAY SPOT Looking at these two phots always makes me sing to myself "When the Coast is Clear" Those phots were taken in September. After the crowds of fishermen have left the beaches. Before the circus came to town." Sometimes I feel that I have spent too much time on this damn computer. It took me a while to realize it. It first hit me when I saw one of the photos of ME on my last vacation. Actually this is a photo of me in Cozmuel Mexico doing some snorkling with a few fish. TheBuffett Concert Ticket Post collection. Will be a collection of Buffett concert ticket stubs from all the concerts that you have attended. If you would like to send in a photo of a concert ticket you attended please send your photo to the below E-Mial address. Here are some of my favorite quotes from his songs. COMING SOON!